It was for that latter reason that I suppose I was apprehensive when Broken Age (which I did not back) hit Steam at the tail end of January. At the time, the thought was that it would be released on Steam Early Access, a concept many of us here at Tap are dubious about. 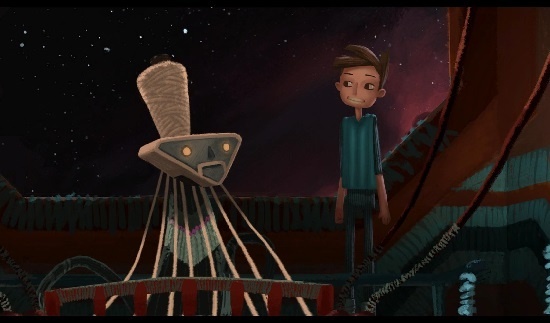 As it turns out, however, Broken Age is taking a more pseudo-episodic approach. This release is Act I, with Act II coming at some date to be announced. They aren’t the only game doing this; off the top of my head I know Revolution’s Broken Sword V (which I did back) is doing this; the first part has been out for a while. I suppose maybe there’s something portentous about putting the word “broken” in the title of your game. But in games, fun heals all wounds, and if Broken Age delivers what players want of it, no one will much care that it was delayed, eventually. The question is whether or not it delivers – or, perhaps more aptly, has a chance to deliver, since it technically isn’t completely released yet. Act II could always make or break the game as a whole, and it’s still unclear when we’ll see that. Long story short, I think it probably will please those longing for the good old days. Shay’s ship operates using a textile-based drive system. I’m not kidding. I am not a Tim Schafer superfan. I like some of his work. I have very fond memories have Grim Fandango, though in recent years some people have given me reason to doubt I’d feel the same way about the game now. I liked the quirkiness of Psychonauts but could never get behind certain parts of the design and gave up halfway through. I love the Monkey Island games and Full Throttle is amongst my favorite of the LucasArts adventures, but I’ve missed most of Double Fine’s output over the last decade, including Brutal Legend, Stacking, and Costume Quest. I did play The Cave last year and thought that was pretty cool. What makes me take notice more often is the promise of someone who was involved in the Golden Age of Adventure Gaming getting back into it. Adventure gaming has never completely gone away, especially since the advent of digital distribution, but they can’t all be Tim Schafers and Ron Gilberts and Ragnar Tornquists. Custodianship of the genre has passed to small, often European operations. There have been good adventure games, but nothing that quite recaptures the flavor of the 1990s adventures, even in Telltale’s follow-ups to LucasArts stuff in the Sam & Max and Tales from Monkey Island series. But maybe that’s nostalgia talking. If I’m honest, Broken Age didn’t make me nostalgic, either, but you can smell Schafer all over it. The abject quirkiness of everything is what most characterizes Broken Age, to me, and Schafer’s work as a whole. There are a slew of punny space cereals. There are cloud-inhabiting cults who remove letters from their given names to be “lighter.” There are ice cream avalanches and hug attacks. There are copious “stool” jokes, because The Stick of Truth is not the only thing that can traffic in humor scatological, although Broken Age‘s are actually funny. Broken Age‘s stool jokes also include a vomiting tree, after all. The game looks beautiful. This we knew from the trailers, or suspected, but it looks great in motion, storybook-like, with character designs that remind somewhat of Psychonauts in their proportions. It works better in the more fairy tale world in which Vella, the female protagonist, lives than the starship where Shay’s adventure takes place, but even there it works out pretty well for the style. To a point, this isn’t a game for setting logic – but then, when are they ever? Indeed, for a while it is difficult to see how the two stories overlap – you can switch between them at will, so there are no specifically timed cuts to use as clues – though by the end of Act I at least some of that mystery is solved. Mostly, it’s just deepened. The writing is the real star here, though, because it is consistently funny and excellent. This is one of those games that makes you want to follow every dialogue path you can just because you want to hear what the characters say. Vella and Shay are both written endearingly, and while they might not have the staying power of, say, Manny Calavera, they are pleasant to follow and root for. If you funded Broken Age, or cared much about it, then you are probably the type for whom the writing would justify the game. The story itself is good, too, if not overly incredible to describe: both Vella and Shay strive to escape the world they were born into. Vella wants to stop the vicious cycle of her people offering up their young women as a sacrifice to a monster called Mog Chothra; Shay wants to escape the starship on which he has been raised, alone but for the computer who mothers him and treats him like a child. 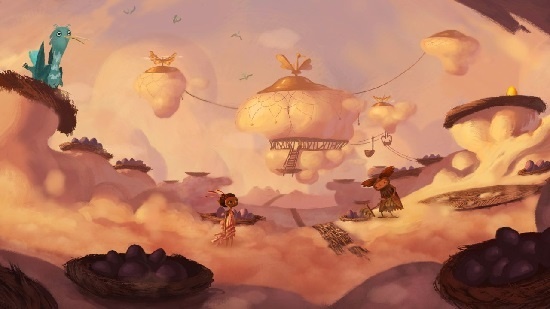 It’s not the premise, but the charm with which they are executed, that sells Broken Age. Where things do suffer a bit from too much old school is that the game feels old school in its design. The adventure genre hasn’t exactly evolved a great deal since Grim Fandango, but for realizing that 3D movement is probably a bad idea, but even modern niceties like hint systems are absent from Broken Age. That’s fine, mostly, since the puzzles aren’t too hard, and are often delivered in fairly discrete chunks; wander around for a few minutes and you’ll find several clear objectives, though it’s not always clear why they are objectives because of the quirky internal logic – and, indeed, sometimes the puzzle solutions are not terribly obvious, given the fact that you have to think like a madman. But mostly the game avoids such things. 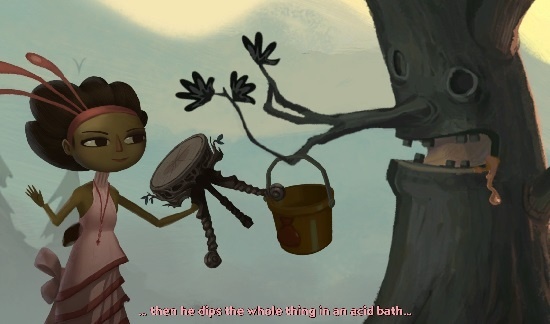 Maybe I’ve grown more weary of the genre now than I was when I last played Grim Fandango or Full Throttle, but Broken Age left me consistently bemoaning the puzzles – with a few exceptions because they were funny – since they got in the way of the next snappy bit of dialogue or something. Even though the portions of the game where I was solving puzzles more than getting dialogue felt a bit like a slog, here and there, I still found my playtime at only a few hours. Steam says four; I feel like Steam is low-balling it, but not by much. Short, but again, this is just half a game. Reportedly, the sales of Act I will keep the rest of Broken Age afloat, so assuming Schafer and Double Fine have their act together we’ll see the rest of the game eventually. Although the world lacks the dark magic of Grim Fandango‘s Land of the Dead, perhaps, the writing will likely please most anyone who backed the game. This is what they paid for, isn’t it? An old school Tim Schafer creation? And so far, that’s what it looks like we’ve got. D’x has relocated to follow in the footsteps of Harm’ny Lightbeard, but you can still reach him at dix@tap-repeatedly.com. Great job, Dix, I’ve been hoping you’d share your impressions. I haven’t played yet, but the general reaction suggests I should, especially if Part 2 comes out and enhances the experience. RPS felt that the game was notably less Tim-Schafer-goofy than most of his work, I was intrigued by that. It sounds like Schafer, maybe older and in a different place in his life, wrote a game about what it’s like to be a teenager. It sounds almost melancholy in a way, and makes me wonder about the title – I sort of imagined it to be a big video gamey connection between the pair, but then got to thinking maybe the title refers to age in years, rather than age as in “epoch,” and the two characters were just an attempt to reflect both genders growing up and dealing with expectations. You suggest there’s more connection between them than that, though, so it’s got me curious. I don’t approve of the overages and mismanagement that must be endemic at Double Fine to have allowed this situation, but it looks like they deserve credit for making something potentially special in Broken Age. After reading it, I don’t think I have ever played a “Tim Schafer game”. In fact, I’m not sure if I’ve ever played a “Double Fine” game. I did back “Massive Chalice”, so that looks like it will be the first one ever. I tended to leave these types of games to Steerpike. He often described them as “charming” and as a serious man who plays serious games, I aint got time for charming games. Out of curiosity, what was it that frustrated you about Psychonauts? I really like wandering around the camp but the part where you have to shoot things frustrated me and I haven’t played it in a long time. 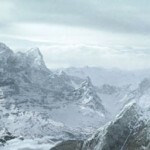 (This is the very beginning of the second mission, so I haven’t made it in far.) I’m wondering if I should give it another shot. @matt w, I don’t know if you’ve encountered Mental Cobwebs or the existence of the Cobweb Duster in the store yet, but about halfway through the game the Cobweb Duster becomes required, as I recall – and it costs 800 Psychic Arrowheads. At the point I reached that part of the game, I had less than half that number, and had barely bought anything with them – and after a while of running around trying to gather them up, realized it was going to take hours of just scrounging for arrowheads and decided it wasn’t worth my time. Presumably, the Dowsing Rod helps speed this up, but I was never very good at using it, try as I might, and the few times that I did manage to dredge up some Deep Arrowheads it was still a pittance. I love Psychonauts. I even bought it on PSN store recently, but the control latency was messed up so I couldn’t play. As game designs go, it did have quite a few shortcomings, but the rest was so hilarious I could overlook them. Ajax, you should play it. You’re too sour. You need a visit to the Psychic Summer Camp. I’m not sure I can look past the financial mess of this whole project. And I didn’t even back it. But how do you ask people for 400k to make a game, then get a ton more than that, and then only deliver one-quarter of a game (or is it one-half; whatever)? I guess I’m just not a big enough fan of Tim Schafer to get past that. My favorite LucasArts game was always Day of the Tentacle, and that was more Dave Grossman than Schafer. I think, like The Dream Machine (which you all should check out as it avoids the usual puzzle illogic associated with a lot of adventures and the first episode is free), I’ll be waiting until the whole thing is released before I take the plunge. I’ve got to say, I’m not terribly excited by this though for some reason. It looks beautiful and I’ve enjoyed a lot of Tim Schafer’s stuff in the past but… I dunno. I blame my fairly recent experience with Grim Fandango I think. I’m not sure I’m built for old-school Schafer puzzles any more.